testo Saveris Web Access - Viewing measurement data via the browser | Levegő hőmérsékletmérő | Hőmérséklet | Paraméterek | Testo Kft. With the testo Saveris data logger system you can enjoy professional, automated humidity and temperature monitoring. This system involves all measurement data being saved in a database and enables them to be viewed and checked at any time by the authorized user. To enable you to call up your measurement data in the most time-saving and user-friendly way possible from now on, we are offering you testo Saveris Web Access as an additional feature: with testo Saveris Web Access you do not need to install the software for measurement data management on every single PC which you would like to use to view your measurement data. Instead, you can access your measurement data from any PC, smartphone or tablet of your choice really easily via the browser. testo Saveris Web Access gives you more freedom and flexibility when it comes to controlling which employees at which workplace can view measurement data from climate and temperature monitoring. Once the data logger system’s database is installed on your internal network, access can be gained from every PC, smartphone or tablet, but of course always only by authorized users after they have successfully logged in. Depending on the configuration of your IT infrastructure, it is possible to use testo Saveris Web Access via both your Intranet and the Internet. This means more employees can check the measurement data or acknowledge an alarm, because your employees are no longer reliant on the use of a specific PC which has the software installed. From now on, it will be possible to make more frequent and faster checks, resulting in an increase in the reliability of your humidity / temperature monitoring. The testo Saveris Web Access user interface is intuitive to use. It offers the most important functions you need to read measurement data and acknowledge alarms. 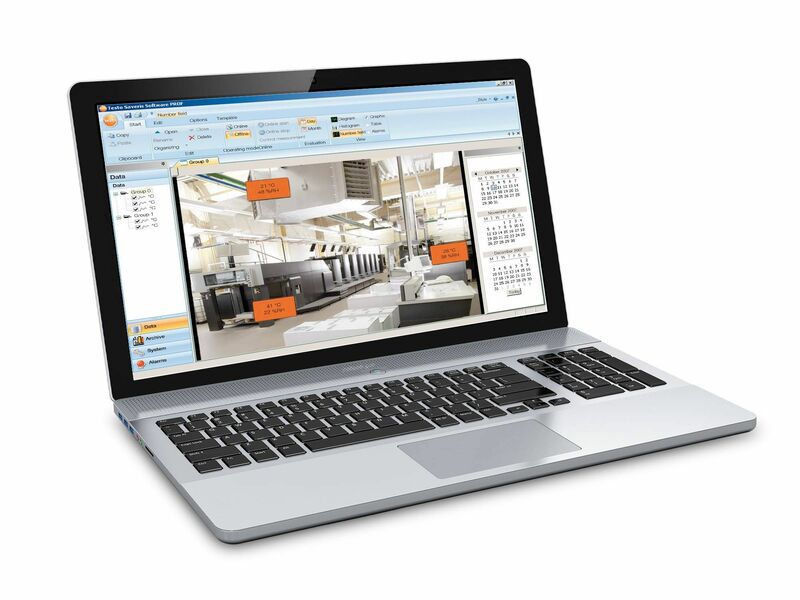 The user interface is intuitive to operate, which means testo Saveris Web Access can also be used without any time-consuming training. Testo Saveris Web Access will ease the workload of power users who are experts in the complex functionalities of testo Saveris software, because they no longer have to be available to answer queries from basic users. In addition, you will reduce the time and effort put in by your IT service, as you now no longer need to install the software on so many computers. This means that testo Saveris Web Access can save you time and money, enable you to work more efficiently and finally ensure greater reliability with regard to your humidity / temperature monitoring.